In the rural areas of Edmonton and its surrounding area, nature is king. While residents are exploring these spaces, nature is creeping in a little closer to home. Moss coverings on trees are beautiful but having it across your property is another story all together. Luckily, our Edmonton roof cleaning and moss removal is only one call away. Edmonton Roof Cleaning: Why it’s important! Gorilla property services understands the importance of your roof and its condition. Our Gorillas also understand the cost (and inconvenience) that comes with replacing it. Replacing materials is an inevitable part of owning a property but with proper maintenance and care, this process can be delayed. Routine roof maintenance gives you the full life expectancy of your structure. Depending on the materials used in your roofs construction, you can expect anywhere from 15 to 30 years on average. Without proper maintenance, this number can be significantly less. In a shifting climate like that of Edmonton your roof sees high levels of moisture throughout the year. Every roof is designed to push water out and away from itself but if there are blockages or bits of debris crowding its surface moisture simply sits on the surface with no where to go. This moisture allows moss and plant life to thrive, climbing over the surface of your roof and even spreading underneath shingles and pulling them free from the roof itself. These openings allow sitting moisture to move into the structural component of your property. 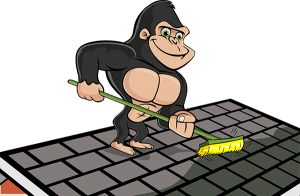 Our Gorillas have been thoroughly trained to not only perform your Edmonton roof cleaning and moss removal, but to spot problem areas, and taking photos in order to discuss these potential issues with our clients. Book your appointments online or by phone with one of our highly-trained Gorillas.